a dwarf race dressed in skins who walk on crytal. hidden. From the sky white dust falls without end. In her third poetry collection, Watermarks (Pedlar Press, 2008), Kingston writer Joanne Page seems to be working at a far higher rate than the gap between her first, The River & The Lake (Quarry Press, 1993), and her second, Persuasion for a Mathematician (Pedlar Press, 2003). Watermarks works a continuation of some of the themes brought out in her previous, writing out "dialogues" and "codex" in her Persuasion, again working through other voices, journal entries, lyrics histories and long expanses of sequential works, from pieces such as "A Brief History of Snow," "Sir John A. Macdonald's Last Season," or the entire section, "From the Hitherto Unpublished Journals of Miss Byrdie T., Inveterate Traveller and Champion of Lost Causes." Usually a poetry that plays with historical characters falls quickly and easily into a remarkable tedium, reworking and repeating what has already been said, but Page's poems reveal a wonderful freshness, as the exception that almost proves the rule. oyster shells, burrs of light. point, point, weight and heft. There is something about Page's poetry that comes quietly and unexpectedly out of left field, a grace and maturity that can only come from a patience borne through years of experience. A watermark is what remains hidden, woven invisible in the sheet of what else, and Page's poetry seems exactly that, hidden below the layers of other poetries currently being written in Canada, unable to exist without, but unable to be seen by the untrained eye. The long winter arrives early and stays late. For weeks no one remembers seeing the sun. the blacksmith's stack filling the forge with smoke. [Wedding cake, etcetera, from the wedding I was at yesterday; more pictures here] By now, you've probably see that magnificent piece that Margaret Atwood published in the Globe & Mail, the same day as my own blog write-up on same, responding to Prime Minister Stephen Harper. Sigh. If it ain't one thing, it's something else. In happier news, plenty of upcoming events in Ottawa and even in Edmonton on the sidebar (look slightly to the right to check them out), including two small press book fairs happening in the capital this fall, including the ottawa international writers festival, starting October 18th with a mini-small press book fair. What the? Armstrong BC: It's always good to see new things by kevin mcpherson eckhoff's bytheskinofmeteeth, producing short hand-bound runs of poetry chapbooks, most recently Calgary writer Helen Hajnoczky's tea cosy (2008). She's been publishing in journals for some time, so it's about time something larger, albeit only slightly, appears in print. Will there be something further down that there road? I find her incredibly irritating. St. Catharine's ON: For some time, poet Gregory Betts has been on about plunderverse [see his essay on such here, at poetics.ca], and written a number of projects based on the idea of using only the words of someone else's work, and only in the order in which the original author has used. 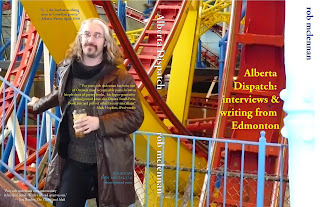 A project of selection, his most recent example of such is the chapbook The Others Raisd in Me (St John's NL: Trainwreck Press, 2008), produced by the same enterprise that also produces the online Ditch Poetry. In this project, Betts has taken only from one piece, writing that "All of the poems in this book were uncovered by crossing out words or letters in William Shakespeare's Sonnet 150." How many pieces can you get out of a single text? Madison WI: The third issue of Cannot Exist came into my mailbox, edited by Andy Gricevich, with poems by Alex Burford, Mark Cunningham, Carrie Etter, Lawrence Giffin, William Gillespie, Kevin Killian, Mark Lamoureux, Bonnie Jean Michalski, Sheila E. Murphy, Andy Nicholson and Dirk Stratton. I've always been a fan of what Sheila E. Murphy has done, but what really jumped out at me from this issue are the pieces by Kevin Killian, a healthy section of his poems that seems to be titled "Cannot Exist." How can I get to see more? Antigonish NS: It's not that often that a poem in a journal really jumps out at me and refuses to let go, but there was just something about Helen Guri's poem "Self-Portrait of my Brain as Five Raccoons" from The Antigonish Review #154. Just who is this Helen Guri? According to her contributor bio at the end of the issue, she's working on a novel-in-verse, lives in Toronto, and has published in a series of other journals, including Arc, Grain and Room of One's Own. Who is this Helen Guri? 1) *PROGRAM ANNOUNCEMENT* *Falling into Words* The Ottawa Public Library (OPL) welcomes local Ottawa Poets Ian Roy, Paul Tyler and Brenda Fleet to the Main Library on Wednesday, Oct. 1 at 7:30 p.m. They will read recent poems and other materials from published works. 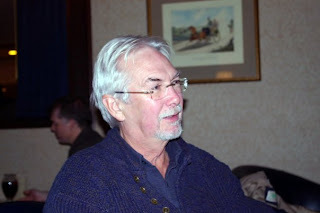 Ian Roy's published works include Red Bird (poetry), People Leaving (short stories) and The Longest Winter. His poems have appeared in numerous periodicals, including Arc, Descant and Geist. 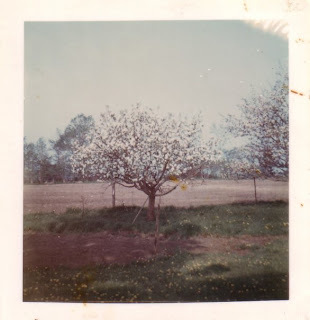 Paul Tyler's poetry has appeared in such periodicals as Arc, Prairie Fire, Grain, The Antigonish Review and the anthology Listening with the Ear of the Heart. Brenda Fleet is the author of numerous books of poetry including Some Wild Gypsy and Woman is Goddess: Montage Poems. The Main Library is located at 120 Metcalfe St. I find it quite terrifying that, throughout an election campaign, Canadian artists have been described by our own Prime Minister as "subsidized whiners," a statement that is unbelievably rude, dismissive and completely insulting, as well as being factually incorrect. Despite the fact that he presumes arts funding to be a "fringe issue," I'm unclear what Mr. Harper is working to accomplish with such statements, on the heels of further upon further cuts, other than to galvanize a segment of the Canadian population who simply don’t have enough information to realize that this is simply wrong. What made him think we wouldn’t work to contradict? The Conservatives, historically, have worked (to my understanding) under the idea of "fiscal responsibility," and, historically as well, every single arts study has confirmed that every dollar given to the arts comes back ten-fold. This, to me, seems a discrepancy. Ottawa as a capital city has ignored such studies for years in their arts funding, and now it seems that the Conservatives, nationally, have reminded us that they also ignore such studies. A billion dollars was spent in Ottawa by tourists in 2004; how many of those tourists were coming to see Nortel, I wonder? How many of them, perhaps, instead went to a show at the National Arts Centre, saw Canadian art at the National Gallery, the Ottawa Art Gallery or perhaps went to one of the local Ottawa theatres and/or artist-run centres, purchased a cd by a Canadian artist, or went into one of the city's fine bookstores to purchase a book by a Canadian writer? Must we look, again, at the example of Flint, Michigan, a dying factory town completely revitalized through the arts? Is Mr. Harper just a bad economist, not comprehending the idea of cultural investment? Why does Mr. Harper presume, automatically, that "ordinary Canadians" aren’t interested in the arts? What makes him so sure of the fact that the arts, whether music, theatre, writing, visual art, music, spoken word or any number of other cultural creations, are the concern of such a small segment of the population that he doesn’t have to take any of these concerns seriously? Even my mother goes to the National Arts Centre to see Canadian plays. The government keeps telling us, Canadian artists, that we have to treat what we do like a business, as though we are being irresponsible somehow and therefore frittering away our time and our resources. Instead, the government continues, instead, to treat Canadian artists as though we are receiving some kind of arts welfare that we waste on irrelevancies, despite all evidence of the amount of cultural workers often struggling to create our art and take it out into the world, and participate in the communities around us at large. Have there been any studies to see, for example, just how much money is generated by the ottawa international writers festival, including hotel stays, bookstore sales, meals in restaurants, cab fares, bus fares, airfare and train tickets, etcetera, by both festival participants and members of the audience, not even to mention those who work directly for the festival itself or the sponsor bookstore, Nicholas Hoare Books. And that is but the tip of the iceberg. A good economy is one in which money moves throughout a broader system. Mr. Harper, we can see where our money goes. Why can't you? Every dollar given to the arts through funding comes back into the economy tenfold. This is an important statement. Even the British Tories, from whom you once took your name, understand that arts funding is an essential service, Mr. Harper. Unless you are employing a tactic of deliberately lying to a population for the sake of playing on their own fears and mis-information, then perhaps you don’t properly understand fiscal responsibility. Short term gain means nothing more than working to get re-elected, and only creates further problems down the road. Boiled down, Mr. Harper reads either as a bad economist, or presumes his base isn’t smart enough to know the difference. Or he was counting on us to respond. And he is using us to obscure something other. will be happening this fall on Saturday, November 15, noon to 5pm at the Jack Purcell Community Centre, Elgin Street [check here for further information]. Can't wait that long? Why not come to the mini-(Ottawa-specific) book fair happening as part of the ottawa international writers festival on October 18, co-hosted by the small press action network - ottawa [check here for further information]? 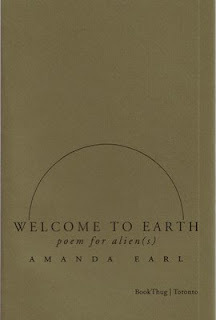 Ottawa poet, editor, blogger and publisher Amanda Earl [see her 12 or 20 questions here] have really been coming into her own as a writer over the past couple of years, and perhaps the best example of her writing so far has to be her new chapbook WELCOME TO EARTH, poems for alien(s) (Toronto ON: BookThug, 2008), on the heels of such publications as the poems Eleanor (above/ground press, 2007) and The Sad Phoenician's Other Woman (above/ground press, 2008), as well as a series of chapbooks self-published through her own AngelHousePress, including deadstreet Gallery presents (2007), 8 planets speaking in tongues (2007) and postcards from the museum of the broken (2007). Earl, co-editor and co-publisher, along with her husband, Charles Earl, of Bywords.ca and the Bywords Quarterly Journal, is part of a group of Ottawa poets that have been developing over the past few years slowly working on writing, and some of which have also been getting attention for their works, whether Pearl Pirie starting to publish in little magazines here and there, Roland Prevost's forthcoming chapbooks with Dusty Owl Press, Marcus McCann's forthcoming chapbook with Edmonton's Rubicon Press, Rhonda Douglas' first trade collection newly out from Signature Editions, Max Middle as the only Ottawa contributor in the Shift & Switch: New Canadian Poetry anthology from The Mercury Press, Ottawa ex-pat Jesse Patrick Ferguson's first trade collection out next year with Freehand Books, or even some of the work happening with Chaudiere Books (both Marcus McCann and Max Middle have first trade collections forthcoming with the press in 2009). Earl has made some interesting forays the past year or two into the long poem/sequence, with her work in such far stronger than many of her individual poems, able to stretch an otherwise ordinary piece, phrase or idea into something far wider, and far more expansive and subtle through extended movement. Part of what I find interesting with Earl's writing is her willingness to be open to new ideas and new influences, based on her own reading. For example, she spent part of last winter writing a long poem influenced by Alberta writer Robert Kroetsch's The Sad Phoenician (Coach House Press, 1983; included in full in his Completed Field Notes, University of Alberta Press, 2002), published a few months later as The Sad Phoenician's Other Woman. This new publication, WELCOME TO EARTH, poems for alien(s), is made up of fragments that are held together through the links that tenuously hold, through "every molecule passed between / the sea dirt pearl shale stone sighs shaped" (p 9), and one of a series of chapbooks that have come out of the press over the past few years, in editions of one hundred copies. But I wonder, why doesn’t this graceful little chapbook include an author bio? Every year an airplane low in the sky, and my father knew. Every year, the same man would come farm to farm selling aerial photos of homesteads, that you could even get framed; great pictures to hang over the mantle. The 1974 shot still looms large in the front porch, showing previous open-porch, the machine shop being built, and the red pick-up I loved, before he traded to blue. Wooden building upon building that stood still in the yard from his father’s time and before, including old machine shed where his heated now stands, and the husk of chicken coop, which even, at that point, hadn’t seen more than pigeons for years. When I read Jeramy Dodd's poems a few months ago in an issue of EnRoute magazine for his CBC Literary Award win in 2007 (he also won the Bronwen Wallace Memorial Award in 2006), it was one of the few times I actually wanted to keep a copy of the issue, to be able to reread them. Finally available in a first trade collection, those poems appear in Crabwise to the Hounds (Toronto ON: Coach House Books, 2008). Still, the only part of this wise little poetry collection by the Orono, Ontario author is the title, otherwise containing short, sharp and surprising small poems that grasp and grapple with the fine-lined restraint of just how the thread of a poem can resonate. I had come to brush my teeth. standing in the corner shower. brings its buffaloes to the cliffs. left from the pouncing of the taps. His preferred structure seems to be the little narrative, bringing in the abstract, but its in the execution, in the leaps and fierce tightness where he creates and sometime excels, writing small, where the shorter the poem, the finer the piece. This is a fine and graceful little book, an impressive first collection. Where do they all come from, these kids with first books that immediately strike? I'm already afraid for where he will go next. when St. Jean's head is lopped into a whisker basket. My father is a pathologist. The origin of the word contains clues to our riddled relationship. Pathos, meaning pity, desolation, suffering. Logos, meaning reason. The word. Once, when I was fifteen, I asked him to describe his work. My friends had started to wonder what he did for a living. "Tell them a pathologist is a guy who uses big words and pisses in the sink," he said. At Lingyin Si in the city of Hangzhou, women come to pray for fertility. Although the name, translated variously as "Palace of the Hidden Immortals," "Temple of Inner Seclusion," and "Temple of the Soul's Retreat," suggests an oasis of tranquility and calm, the place is wildly popular with Chinese and Westerners alike, and all day long its crimson halls echo with the snap, gaggle, and stomp of tourists. Zen monks remain in residence, but the clink of cash registers louder than the chime of prayer bells. ten-yuan notes deposited by other supplicants. The girl's sharp-edged haircut, fashionable clothes, and vivid makeup announced a modern sensibility, but the look on her face expressed reverence and fervent desire. Ignoring the pushing crowds, ignoring our prying eyes, she bowed and whispered her prayers. I ask Mark for his perspective. He's lived with me a long time; he ought to know. How has becoming a mother changed me? "You're more patient," he says. "And less. More patient with Maia. And less patient with the world." A fact is brutal it stands over a hole. You can't step into the same river twice, they say, or at least Heraclitus. Saskatchewan poet John Newlove made a reference to such in one of his poems, "You Cannot Step Twice" from Black Night Window (1968), and I've sprinkled it, somehow, into pieces of mine every couple of years since. It's a powerful idea, different thoughts on the difference of same. In one poem, I even went as far as to say that it might be a different river, but your shoe and sock still get equally wet. It might as well be the same. The lemon is another sly theft from Alberta writer Robert Kroetsch, riffing off Wallace Stevens' infamous poem about blackbirds, another line leading directly to another line. Can literature ever exist on its own? No matter how hard we try, we can no easier create art out of nothing than become our own parents; there is always a place where we begin, outside and before ourselves. The woman I was spending time with during this poem was far more trouble than she was worth, and has long since been excised, although she still has a couple of my books that I want back. I really should have learned long ago not to loan anything to anyone. This piece is a part of The Ottawa City Project (Chaudiere Books, 2007), the book on the city I managed to somehow return to at nineteen, and this section on Ottawa's old lumber-town history from the Victorian era, making fortunes for lumber barons Booth, Eddy. A foundation of ships long since taken down, once the British no longer needed our Ottawa Valley timber for masts. This is the river the English called Ottawa and the French called les Outouais, originally called Grand by the European influx, not figuring to ask what the locals still knew it as. Champlain and others who navigated its shores, what we swam ourselves in under Canada Day fireworks in 1996, perhaps troubling our still-future health for the filth of the Ottawa River, ash floating down on our floating heads. Around the same time, I was reading Robert Legget's Ottawa Waterway: Gateway to a Continent (University of Toronto Press, 1975) for the sake of research on my travel book, Ottawa: The Unknown City (Arsenal Pulp Press, 2008), working through the Outaouais, the Algonquin, Samuel de Champlain, and the steam ships and the advent of rail that took out the steam ships, and even the advent of cars that took out the rail. For a couple of decades before and just at the turn of the 20th century, there was a hot springs in eastern Ontario, downriver some, just before the Quebec border, as the Bytown & Prescott Railway Company making regular trips to Caledonia Hot Springs, where heads of state and even royalty would visit for the spring's healing powers. What is it about history? It's difficult to even find references to such, and there are barely stones in the field to mark where the buildings once sat, completely erased, it seems, despite the trains and the steam ships that took important passenger cargo to visit, including British royalty and various heads of state. How does something so grand disappear so completely, so quickly? So far, the only book on the Caledonia Hot Springs was written and published in French; I await the translation, so I don’t have to write the same thing myself. Will it ever happen? faster than running, forests knock me down. in your snow-haired wing, your open ear. know how to be unless it gets me something. and the school bus going home. up the steep road that leads to a tower. at the feet of pines. According to my notes, this poem, hidden in my little chapbook search & rescue (Mercutio Press, 2003), was written around 6am from the Ottawa International Airport, Macdonald-Cartier, on July 20, 2001. Where would I have been going? I might have been going out to that West Coast Poetry Festival in Vancouver, but I'm really not sure, usually wanting to keep my summers open for the sake of my child. Where did the lines all come from? I know I'd received a copy of the new filling Station but days before from derek beaulieu, travelling with such as reading material, reading distraction. I know the Coke and Pepsi line from George Bowering, a little poem he had in the same issue. I'm sure if you looked, you could probably find the rest, which is why I was so open about where the lines came from. Is it still theft if you give such credit? i dont care whether i get coke or pepsi. he mentioned nothing about the german streets. the sun forgets to close. dont you know sirens end w/ punches. I've since worked to be more sly about where I steal lines, and twist lines and phrases into such unrecognizable forms that you would simply never know where they might have originated. Sometimes, even, a phrase causing another to appear in my head, and the point-of-origin irrevocably lost. I even admit that this poem is lazy; should I even take credit? Does this matter at all? As Gregory Betts has already written, the idea of plunder is one of working through found material, writing already there, reworking out of what has been written into something else. It's what the character in Barbara Gowdy's novel Mister Sandman (1995) did at the end of the book, turning her home recordings of her family's voices back on themselves. Or poet Lise Downe, writing in the acknowledgements of her poetry collection, the soft signature (ECW Press, 1997): "All of these words have appeared elsewhere. Only their order has been changed, to maintain their innocence." Is there still such a thing? On Sunday, Christine McNair and I wandered around the 20th anniversary Eden Mills Writers' Festival, just near Guelph, Ontario. McNair (I produced "poem" handouts by myself and McNair for the event) was heading there anyway, and let me tag along with her and friends Amy Dennis (we picked her up in Burlington) and Abby Whidden (who was reading in the Fringe category, and we picked up in Toronto). I had never been to Eden Mills before, despite many years of wanting to go, and it was raining when we got there. Eden Mills is such a pretty little town. Apparently the whole town loves Leon Rooke. In front of "Jenny's House," which was also used as the festival "hospitality suite" for the various authors, there was a banner that said "We Love Leon Rooke." I mean, who doesn’t? [David McGimpsey & Paul Quarrington, above] Some of the participants in this years festival included writer Amatoritsero Ede, Nigerian poet/editor, who was also the PEN Canada writer in exile at Carleton University a few years ago, David Chariandy, Patricia Claxton, Karen Houle, David McGimpsey, Rebecca Rosenblum, Leon Rooke, Alistair MacLeod, Janice Kulyk Keefer, Lawrence Hill, Paul Quarrington, Anita Rau Badami and Nadine McInnis. Some of the others wandering around included Kitty Lewis, working the Brick Books table, Stephen Henighan, Shane Neilson and Paul Vermeersh. I think I want to read at this event next year; maybe with my new poetry collection from Talon? [Kitty Lewis, looking adorable] Check out more photographs I took here, hiding out on facebook. Now we go through some of the other events coming up (including a reading I'm doing), before the ottawa international writers festival starting October 18th with the festival book fair, yes? Writers and artists know all about obstacles to creativity, from our own fear and procrastination to the practical challenges of finding time and space to work. Led by an Ottawa writer, this eight-week interactive workshop will give you a toolbox of techniques for overcoming these obstacles so you can get more done on your artistic projects. Books come from books; isn’t that what David W. McFadden used to repeat? In Ireland, I watched Stephen Brockwell at Thoor Ballyle, Yeats' infamous tower near Galway, taking photographs and generally being neurotic, in that way only Brockwell can. Did he end up writing a poem about the visit? I don’t recall. I remember he spent ten minutes obsessing over the fact that he couldn’t find the lens cap to his camera, when it was in his jacket pocket the whole time. Or was it still in the car? We were doing a little reading tour around Ireland in 2002, spending a few days in Dublin, and doing three daily readings in Dingle, Galway and Cobh, able to stop our little rental car by Yeats' tower along the way. Unfortunately for his plans, since we were there in February, we were two months early, unable to get inside and tour around. Given that the country had relatively few tourists wandering around but for us, I don’t think either of us minded the trade-off. What has this to do with Keats? Absolutely nothing. Yeats. Yeats. Yeats. Yeats. Yeats. Yeats. Yeats. Why wouldn’t the man shut up? But that's beside the point. I'd read a few David Bromige books here and there, including books by Brick Books and Black Sparrow, but it was the one that I picked up from Janet Inksetter's former store location for Annex Books, Birds of the West (Coach House Press, 1974), that really struck me. Struck enough to fall into this little piece, left in the middle of the book that became name , an errant (Stride, 2006). Bromige is one of those Canadian west coast 1960s poets, one of the University of British Columbia student-poets, that participated in the infamous 1963 Vancouver Poetry Conference, despite heading south a year earlier to Berkeley for further studies. 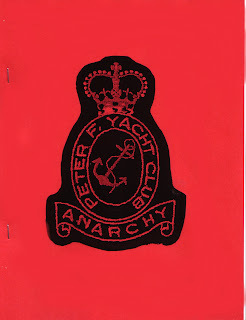 Part of a group of Vancouver writers that included George Bowering, Frank Davey, Fred Wah, David Dawson and Jamie Reid, he kept in touch through correspondence with his Canadian friends, as well as publishing books with Talonbooks and Coach House throughout the years, as well as over a dozen by American publisher Black Sparrow. Wasn’t there a story of he and George Bowering sending inappropriate emails back and forth on the SUNY-Buffalo Poetics list-serve a few years ago, and being asked to either leave or tone down? It was the short lines Bromige used in this particular collection that triggered, working his own kind of references to Keats in one of the pieces. Are all poems simply responses to other poems? 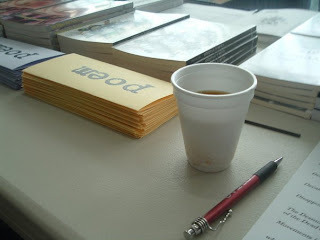 Writing from writing, McFadden said, books from books. Whenever I travel, I like to have a familiar place I return to daily write, whether a particular coffeeshop in Vancouver just by MacLeod's Books, a Second Cup on Whyte Avenue in Edmonton or the Grad Lounge at the University of Alberta, or the Future Bakery on Bloor Street in Toronto's Annex. This particular poem was written at the Future Bakery, close enough to the University of Toronto to be a student hangout, and where, over the years, I've seen, deliberately and accidentally, writers such as Nathaniel G. Moore, Adeena Karasick, Stan Rogal, Steve Venright, Colin Christie, Beth Easton, Rebecca Rosenbaum, Leon Rooke, Catherine Kidd, Dana Bath, Corey Frost, Cary Fagan, Jim Munroe, Andy Brown and various others. 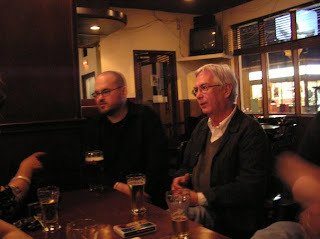 Years ago, I would regularly drop in at the Book City location nearby to visit with writers that worked there, including Derek McCormack, Patrick Rawley, Paul Vermeersch, Alana Wilcox, Chris Chambers and John Degen, and to even be near St. George Street and not visit Coach House is simply a crime. The years of Victor Coleman and Darren Wershler-Henry before the advent of Alana Wilcox, with the numerous threads that might never leave: Nicky Drumbolis, Rick/Simon and Stan Bevington. Toronto writer and editor Michael Holmes even wrote a small book in the same Future Bakery a few years before I started writing there, published by Coach House Printing, predating the new Coach House Books by a couple of years, produced in a cd case as Satellite Dishes from the Future Bakery (Coach House Printing, 1994). I don’t think I've been nearly so overt. Still, I've done enough travel that I like my routine, my comfort, returning daily to a particular locale for the sake of grounding, to be able to sit and to write, take notes. How else to feel like a person during such a displacement?